I’m a Stihl man meself, but a friend of mine, Ed Kyrk recommended this little gizmo, it was recommended to him by someone throwing his Stihl file guide in the burn and giving him the Husqvarna one to use. 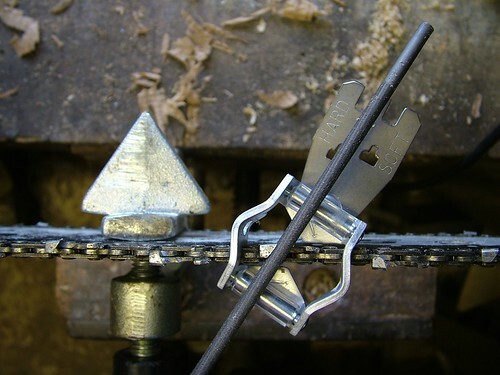 The guide is a little saddle which fixes the angle as two notches sit on the bar/chain, the clear plastic jobbies are rollers. 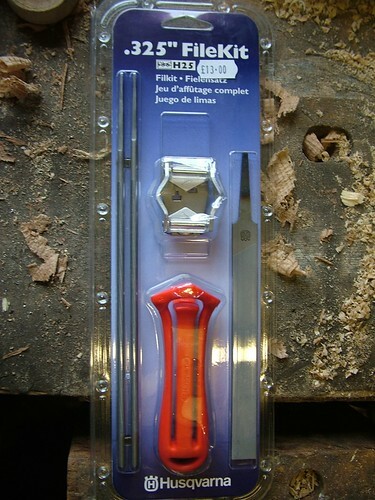 The whole set up moves in the vertical axis with the chain so you don’t need to angle the file in the horizontal plane. The magic is though, you can see exactly what the sharpened link is looking like AND the file can roll. I started using it as I’d seen Ed do, without a handle so it would roll. That was a bit uncomfy so I thought I’d try the red handle (good colour, less likely to disappear on a shaving covered floor). Turns out the handle lets the file roll too. The guide for the depth gauge on the chain , as you can see has two depths, one for hard wood and one for soft wood (eh?). All in all an excellent £13 worth. You used to be able to buy the guide on its own, but now it comes as a set. RECOMMENDED. Away from the razor-sharp and noisy world of chain saws (and we heard enough of those 400cc competition screamers at the APF!) 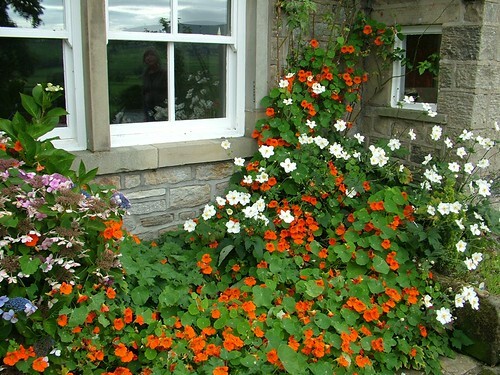 the single nasturtium outside our front window has grown into a giant – take a butcher’s* at this! * Cockney rhyming slang – butcher’s hook – look.